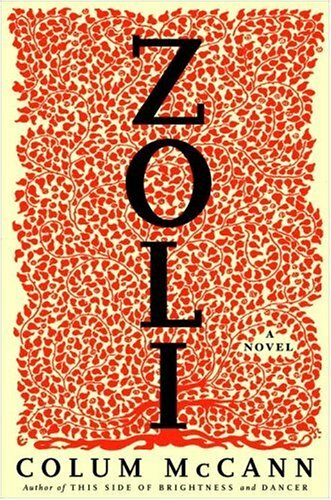 Zoli is the third book I have read by Colum McCann and once again, I am amazed by the depth of his work. Written in 2007, this book is one which jumped out at me while I was searching for another on a nearby shelf in our library. For the past two days, I have been unable to put it aside. The novel contains many passages which made me stop to catch my breath. This is a fictional novel about a Romani (Gypsy) woman named Zoli who sings traditional Romani songs and writes poetry about her people in Czechoslovakia when they roamed freely about the countryside during the political upheavals prior to World War II. It is also about a young man from England who befriends Zoli and the inadvertent way his Socialist ideals lead to radical changes in the lives of the Romani people. On a larger scale the novel is about political agendas and governmental control. I think this is an incredible story about a group of people whose culture and history has always intrigued me. If you choose to read this book, I hope you will love it as much as I did. This entry was posted in Uncategorized and tagged Books, Colum McCann, Communism, Czechoslovakia, Fascism, fiction, France, Gypsies, Hlinkas, Italy, Lenin, Romani, Soviet Union, Zoli. Bookmark the permalink.